Here's why Chuy's and its restaurant peers got a boost from the election of Donald Trump. Image Source: Chuy's Twitter page. Shares of Chuy Holdings, Inc. (NASDAQ:CHUY) jumped last month after the election of Donald Trump. According to S&P Global Market Intelligence, the stock gained 10% in November. As the chart above shows, almost all of Chuy's gains came in the days following the election. Restaurant stocks across the board rose, as the market believes that a Republican administration will be less likely to raise minimum wages and take other measures to raise labor costs that are seen as unfriendly to businesses. 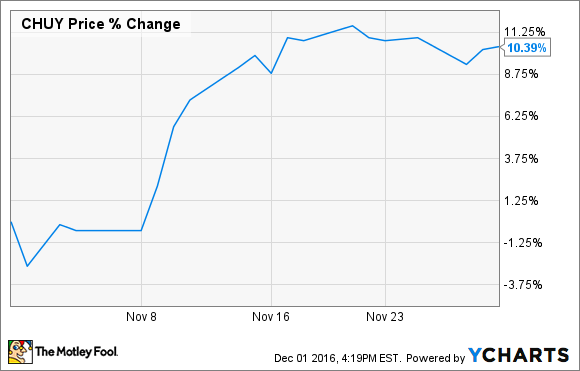 In the four trading sessions following the election, the stock gained nearly 10%. Headquartered in Texas, Chuy's is heavily concentrated in its home state, which follows the federal minimum wage of $7.25. Chuy's also turned in a decent third-quarter earnings report at the beginning of the month when comparable sales increased 0.3% and adjusted earnings per share improved 21% to $0.29. However, the stock hardly reacted to the results, rising 1% on the news. Chuy's does not offer franchises, meaning the company is directly responsible for all of its restaurant workers, and labor costs have taken up nearly a third of the company's revenue this year, which may explain why the market sent the stock up on news of Trump's election. However, while a Trump administration may be kinder to businesses, wages are still rising as the labor market has gotten tighter and several states have taken the initiative and raised minimum wages themselves. An unwinding of the Affordable Care Act could also help some restaurants, but the overall economic climate will likely be the biggest factor to influence Chuy's and its peers. If macroeconomic growth remains strong, restaurants should benefit. For the fourth quarter, the company sees adjusted EPS of $0.15-$0.18, and comparable sales of flat to 1%.